Senjōgahara Hitagi might be as light as a feather, but she is also heavily armed with all kinds of office equipment. She is a no-nonsense girl with her own ideas about life and the strength of character to elbow her way through any opposition. She also has a secret she must keep under wraps at all costs, even if it forces her to inflict bodily harm upon all those who involuntarily find out about it. Senjōgahara's determination has its root in a weakness she desperately tries to hide. Senjōgahara's insecurities gave her a cynical outlook on life and a sharp tongue for defense. She calls herself a tsundere and certainly knows how to act the part. She remarks off-hand that her body is not worth committing crimes over, but is good at showing it off. Her verbal abuse is close to becoming an art form. Her blunt approach remains even when it comes to difficult tasks like confessing her love. 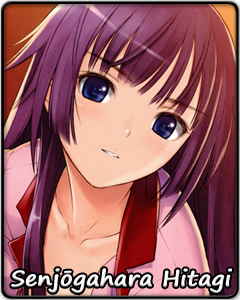 Senjōgahara Hitagi gives the impression of a person who will never crumble, no matter what obstacles she has to face. It is all the more important, then, to realize that she is silently screaming for help.